Oh, for the Love of…Umbrella Brooches! | Oh, for the Love of Vintage! Oh, for the Love of…Umbrella Brooches! As you probably realize I have a ‘penchant’, ‘thing’ and ‘obsession’ for many, many things. I love and collect many different kinds of vintage brooches, including jelly belly brooches, flower brooches and various animal and insect pins. 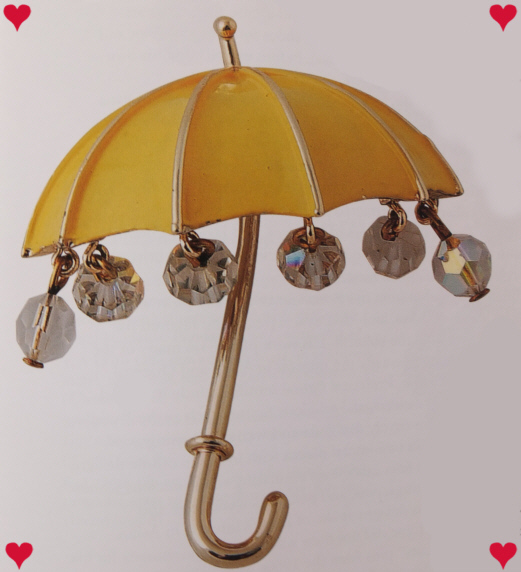 Today, I’m going to focus on another one of my loves, umbrella brooches. With the introduction of novelty pins in the 1930s, umbrella brooches became very popular. 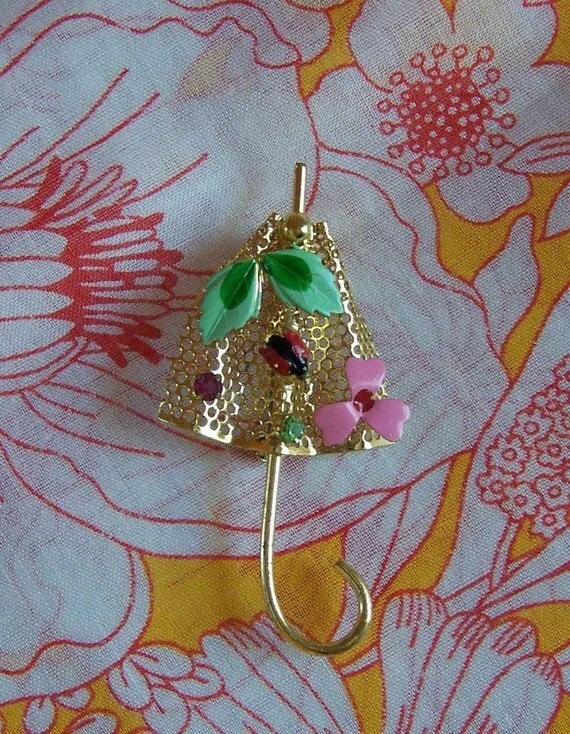 I’m not sure why I love umbrella brooches so much, they just make me smile! Also, they look amazing on a vintage dress, sweater or coat. Below we have two of my umbrella brooches. On the left, a metal, lucite and rhinestone 1930s stick pin. 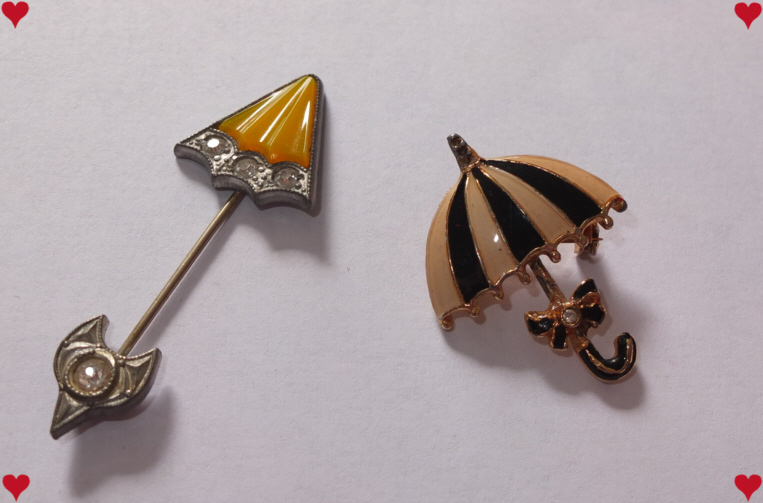 On the right a 1950s enamel and rhinestone umbrella pin. 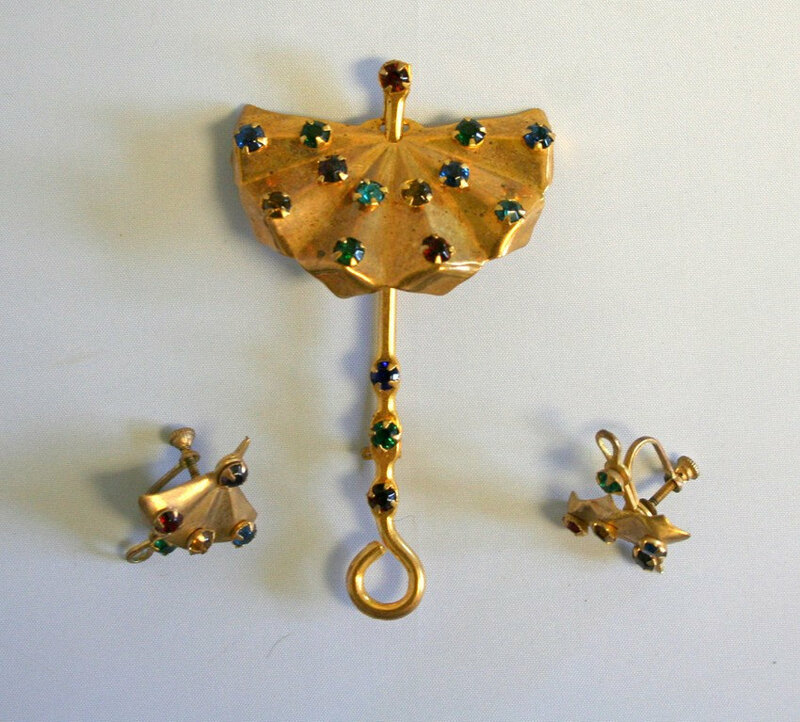 Next we have a French Art Deco petit point umbrella brooch, with purse. 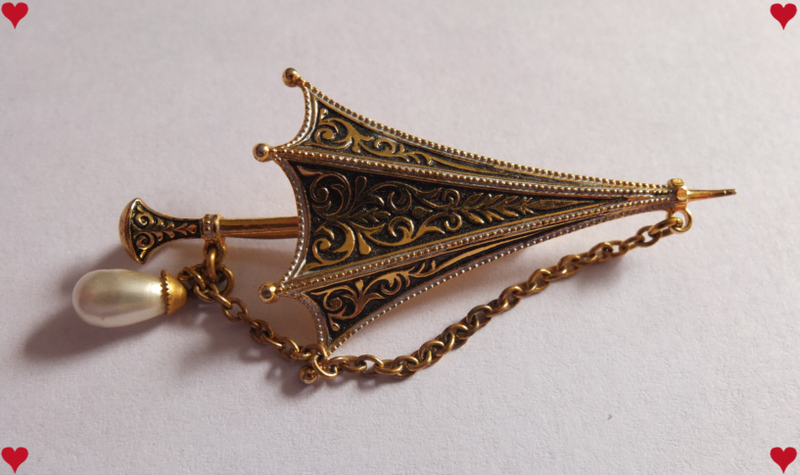 This is a beautiful example of a more delicate umbrella brooch. A Spanish gold damascene brooch with dangling faux pearl. You can find amazing umbrella brooches for sale on Ebay and Etsy, including the same that I have in my collection. Below, find some sweet examples from those websites. Singing in the rain, just singing in the rain…..
What a glorious feeling, I’m happy again…. 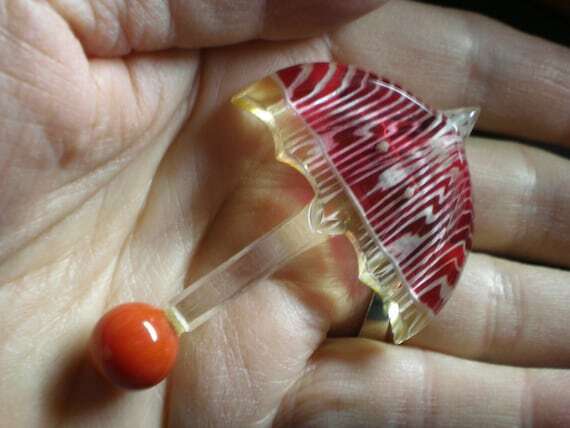 hi i have a depose vintage/antique celluloide umbrella brooch i am about to put on eBay i was looking up info about it when i came across your page so thought i would offer it to you first if you are interested thank you. Aw, they’re so lovely!The damascene one is my favourite, I think. Oh, my goodness! How did I miss this post?! I love, love it! Along with the jaunty lyrics! I could watch and listen to Gene Kelly for days. Enjoy the weekend. Keep on shopping! Pingback: Treasure Trove « Oh, for the Love of Vintage! 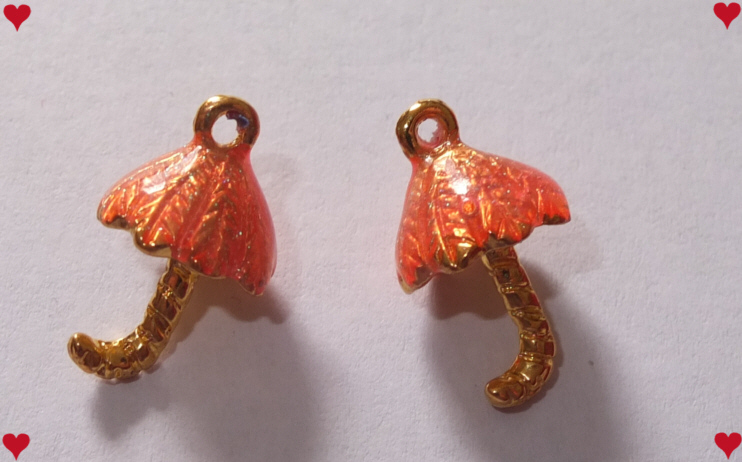 Lovely brooches 🙂 I am hoping you may be able to give me some advice on an umbrella brooch that I found in a small antique store. Your site is the only one that has a picture of the exact one that I found. 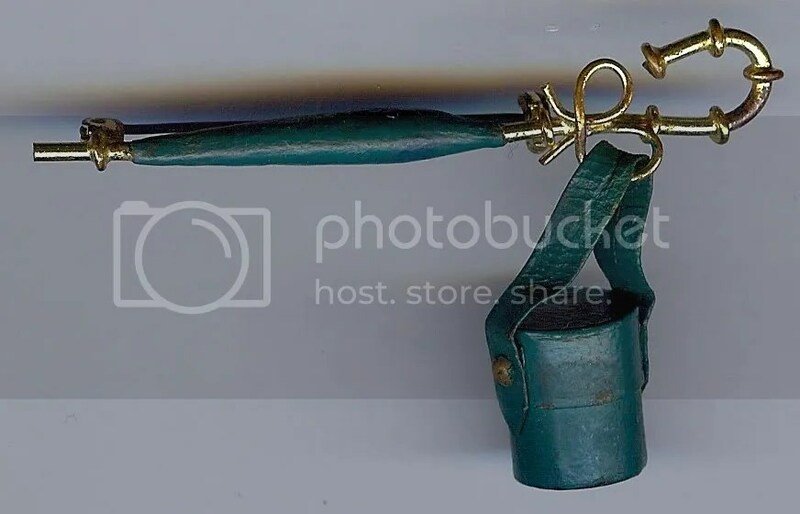 (The Spanish 1950s point umbrella, with the dangling handbag.) I found several online that were very similar. Im just trying to learn more about it. How rare is? How much its really worth? If you can share your knowledge I would be grateful.